Using the unifying theme, “No Democracy Without Women”, FAMM and its allies engaged thousands of people across the country to raise awareness on the importance of women’s leadership and participation in political processes, and to encourage women—especially young women—to vote in the upcoming legislative election (April 9) and presidential election (July 9). The goal of this initiative was to help women see how their voices are an essential part of democracy and how participation in elections is one way of using their voice to demand change. This is especially important in Indonesia where many women are not fully aware of their rights as citizens or how to engage in political processes. 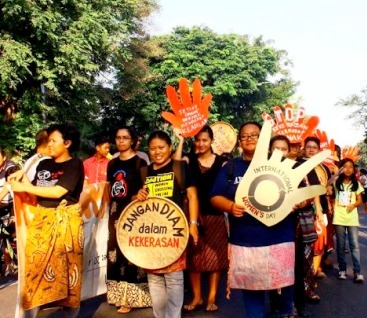 FAMM, a network of 300 diverse young women (LBT, Muslim, farm workers, factory workers and indigenous women) led and joined other organisations in conducting various activities throughout 30 provinces of Indonesia. In Banda Aceh, FAMM member Wanti Maulidar participated in a radio talk show on women’s political role as voters. In Makassar, South Sulawesi, FAMM and other organisations, including local partner PEKKA, gathered 700 women for an event—opened by newly elected Makassar Mayor, Denny Pomanto—to publicise the Declaration of Women’s Political Agenda to Establish the Diversity of Indonesia. This event attracted coverage by major national and local television and newspaper outlets. In Palu, Central Sulawesi, FAMM members organised and spoke at an event entitled, “Young women, leader of the future” which was attended by 165 women and 30 men, including Head of Tawaeli District and Palu Mayor, Rusdi Mastura. Many women involved in these events were inspired to continue the process of raising awareness. For example, in East Kalimantan, a group of indigenous women put plans in motion to establish a political school for women. Others said the events helped them better understand their political rights and the importance of participating in all aspects of the political process. As the elections approach, FAMM will continue to organise dialogues among young women to strengthen their confidence and skills training to exercise their voice and rights in politics. Hivos works with frontrunners of change and social justice to further women’s rights and lobby for new laws protecting women against discrimination and sexual and domestic violence. Our partnerships with global organisations like Just Associates (JASS) play an essential role in linking local activists to the global instruments of United Nations treaties and special rapporteurs. JASS has been a Hivos partner since 2006.